A doctoral student focusing on nineteenth-century Mormon women, Jenny Reeder feels passionate about bringing our foremothers to light and letting their stories inspire women today. 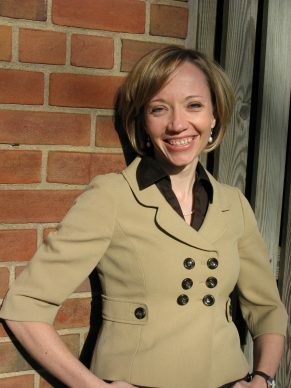 Jenny not only studies Mormon women leaders, she’s worked with them: She represented young singles on the Visiting Teaching Curriculum Committee under Bonnie D. Parkin. How did you become interested in Mormon women’s history? I went to Brigham Young University (BYU) for college where I studied Humanities, and in the middle of my college years I went on a mission to Italy. My parents had divorced when I was on my mission, and when I returned home I lived with my mother and finished my degree. I attended a singles ward in Provo, UT, where I had a visionary bishop, a wonderful man and a great mentor—a father-figure—who encouraged me to get a master’s degree in communication. I attended Arizona State University (ASU). The communication degree wasn’t really my thing, but I’m not a quitter so I saw it through. In the summer between my two years in Arizona, I came back up to Utah and worked as a research assistant for Carol Cornwall Madsen [BYU emeritus professor of history and research historian with the Joseph Fielding Smith Institute for Church History]. I can’t even remember how I came to know who she was–I think I read a devotional speech she gave at BYU and I was intrigued by it and I emailed her out of the blue and said, “Hey, I’m going to be in Utah over the summer, do you need a research assistant?” And she said yes. I’d never had a history class in college, but that summer changed my life. I really became interested in Mormon women’s history. I went back to ASU for my second year and completed a thesis on quilts as cultural artifacts for the Relief Society. I worked for Carol again after finishing at ASU. Well, that turned into a three year position at the Joseph Fielding Smith Institute for Church History where I worked as a research historian and documentary editor. At first, I worked mostly with Carol on her Emmeline B. Wells biography and then with Carol and Jill Mulvay Derr [BYU religious education professor and director of the Joseph Fielding Smith Institute for Church History] on documents from the first fifty years of the Relief Society. I soon felt like this was part of my mission in life, to work with these documents. I realized that this was what I wanted to do. I knew I couldn’t spend a career as a research assistant, and that I needed a doctorate degree to really move forward. Because I didn’t have an MA in history, I applied for to a master’s program. I attended New York University, where I earned a degree in history and archival management and historical editing. I lived in Harlem. I loved it there. 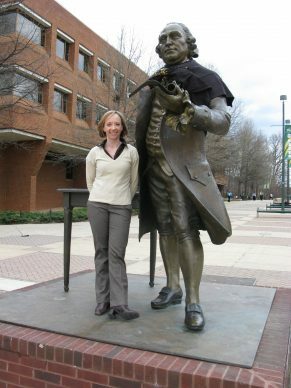 Now I’m in an American History doctoral program at George Mason University in Fairfax, Virginia. What aspect of the Relief Society’s history are you focusing on in your dissertation? In my dissertation work, I’m looking at how the members of the Relief Society in the late nineteenth century tried to situate themselves among mainstream American women in several different ways: being active in suffrage, going to medical school, being on the National & International Counsels of Women, writing for newspapers, etc. They worked against a lot of cultural prejudice due to polygamy and theological differences, as well as geographic dislocation from the American heartland. I believe that similar to Jewish and Catholic women, as well as other groups of ethnic women, Mormon women worked to present themselves and their identity in a way that appropriated ideas of Americanization. I also believe that they “used” their past — they presented their heritage (in a very Victorian way as “custodians of culture” and “guardians of history” according to Victorian gender roles) in a very strategic way, discarding the pieces of the past that didn’t work for the American mainstream, and highlighting the things that made them valuable. You say Victorian members of the Relief Society acted as “custodians of culture” and “guardians of history”. Do you think the Relief Society still has a responsibility to protect culture today? In what sense? I do. I think it’s different today simply because we’re so much more global than we used to be. The context of the world around us has completely changed. While Church doctrine remains the same and must be maintained and protected, there is no longer one distinct culture to protect and promote. Part of our responsibility now is to teach members of the Church of both genders to preserve their own cultures and their own communities. There is a responsibility that continues today to maintain identity and belief and core values that don’t change, but in a worldwide context. What are personal goals after you complete your schooling? I have no idea where I’ll end up after I graduate. There’s a part of me that really really really wants to be married with children — and yet I know that’s not the full extent of my life mission and that I will juggle a professional career with my family. I love teaching, but I don’t know that I see myself in an academic publish-or-perish position. I do have two “dream” jobs: To take over the Daughters of the Utah Pioneers — professionalize, digitize, and unify it as an organization — and to be the Mormon women’s manuscript curator at BYU. However, at this point in my life, I’m not ready to head back to Utah, so we’ll see when it comes time to really look for jobs. You wrote the Relief Society messages in the Ensign for a time. How did you get to do that? It’s a funny story! After Bonnie Parkin was called to be the General Relief Society president in 2002, I was really impressed by her testimony at her first General Conference. I wrote her a quick note and just told her I supported her and I looked forward to her administration. She actually sent me a letter and asked if I would come meet with her. I went up to her office and we talked for an hour or so and we had a delightful visit. She wanted to know my experiences as a single woman in the Relief Society. About four or five months later, I got a letter in the mail informing me that I was on the Visiting Teaching Curriculum Committee, responsible for the Visiting Teaching message that appears in each month’s Ensign and Liahona magazines and is distributed worldwide. It was a great experience. There were only five of us. I felt like I was the token single young person! Everyone else was married and much older than I was. We met once every month and we took turns writing the message and reviewing it with each other. We didn’t really write it, I guess. We gathered quotes that we thought were appropriate for the topics chosen by the General Relief Society presidency. Our committee determined it was important to have a quote from a woman in the message each month. I learned a lot about how church curriculum committees work! What were some of your other takeaways from that experience? Everyone on the committee would say that the most impacting thing about the experience was that our names didn’t go anywhere. Nothing was mine: My name was never put on the messages, I didn’t own anything. I simply felt like I was an instrument. I learned how important it is to have people doing that ground work for the Church’s materials. The other thing that was fascinating was understanding the importance of the Visiting Teaching message. At that point, the message was translated into 75 different languages. Some of these 75 languages don’t even have the Book of Mormon translated yet. They don’t even have the Liahona. The Visiting Teaching message — along with the First Presidency message — is the only official thing that the people of these languages get from Salt Lake City. It was a lot of responsibility, but we really worked hard to make sure we didn’t have tight cultural references in the quotes we selected so that they could be helpful to women all over the world. One time we wanted to use a quote by one of the living apostles who talked about how prayer is like having a direct phone line to the Lord. And we realized that we couldn’t use that, because people in some third-world countries would have no idea what we were talking about. Our goal was to recognize the real core of the doctrine, stripping it of metaphors and stories. We didn’t want anything fluffy or cheesy. We also decided that by focusing on the core doctrine we could allow women wherever they were to apply it to their own lives and share their own stories with the people they visit teach. From that interaction with the General Relief Society presidency, what did you learn about the power of the Relief Society organization in the world? I loved Sister Parkin’s goal for her presidency: She wanted women to feel the love of the Lord in their lives daily. It’s important to realize that these Relief Society leaders are anxious to serve and to lead. They can receive revelation. There’s power in their callings. My personal understanding of that comes from my knowledge of the history of the Relief Society and the stewardship that these women have had since the time of Emma Smith. It is a stewardship over the women of the world, to make sure they’re on the path that God would have them on, and that they are working as partners with the priesthood in building the Kingdom. You mentioned that you talked to Sister Parkin about your experiences being a single woman in the Church today. How do you fit yourself into church culture being a single woman today? I’ve grappled with this a lot in the past and it’s something I don’t grapple with it as much anymore because I feel that I personally am in a really good place in my life. I’m in a really great ward. My ward is 40% mid-single and my bishop has done amazing things to integrate us. All of our auxiliary presidents are single women. We have two Relief Societies, divided geographically. I think the bishop recognizes the value of the single people in our ward. When I was in Harlem it was really hard to be single in my ward there. The first Sunday I was there I was put in the Primary, and there I stayed the whole two years I lived in that ward. I never had Visiting Teachers or Home Teachers. I never had adult contact except with the parents or other Primary teachers. That was hard. It’s important to realize that these Relief Society leaders are anxious to serve and to lead. They can receive revelation. There’s power in their callings. Right now, there’s a rumor going around that an older singles ward is going to be created here. And I don’t want to go! I love being in the family ward that I’m in. I love having interaction with married women and older women in my ward. I love the diversity of that. I love that they seek me out, I seek them out… There’s no difference between us. We sit next to each other. I hold their kids, I babysit their kids. It’s an incredible partnership where we look out for each other. I have struggled with being a single woman in the Church, but I’ve come to a really good place where I’m confident in who I am, and I’m confident in the direction my life is headed. And I think that’s come from having a strong sense of my personal mission in life. I know that my education is a part of that mission. I know that I want to get married and have kids and I know that’s a part of my mission too and that will happen one day and I look forward to that. But I’m content too with where I am, and I think that comes from having a strong relationship with Jesus Christ and learning to utilize the Atonement in my life. Is there some advice you might give other single LDS women to help them find the peace you have? The best advice is to recognize that we all have missions in life. We all have incredible talents to contribute to the world around us. We can do wonderful things, whether we’re married or not. That doesn’t really matter. It’s important to recognize the power of the Atonement and recognize that immediate power that God’s grace has to enable us to be better at what we’re trying to accomplish: To be better people and to be healed. But we also can’t lose site of the importance of marriage and family. It’s a tricky balance — you go one way and you may lose site of the other. We have to learn how to maintain that balance: Feel personal fulfillment without losing site of the importance of being in families. My family has had a lot of crazy challenges and part of me feels, “Ugh! I don’t know what I can do to help them!” And there’s another part of me that realizes I am separate from them. I can serve them and help them in a lot of different ways, but I have my own life. And I’m happy with the way my life is turning out and the decisions I’ve made, the friends I have and the support system that I have. I mean, I’ll never be entirely separate from my family and I don’t think that I should be, and yet I’ve found great peace in becoming who I am individually. It’s probably a realization I should have come to ten years ago! Could you elaborate on how studying the original Latter-day Saint women informs your identity today? Are there things that you do to emulate them? My understanding of the history of “my” women has provided me with an incredible sense of identity and connection — to them as well as to LDS women around the world today. I have a richer understanding of the mission and role of women in general, and I appreciate the responsibilities, experiences, attitudes, and deep beliefs of these women. There are a number of stories about these early Latter-day Saint women that inspire me to be the person I am today. There’s a story I love about Eliza R. Snow. She was the head of the board of Deseret Hospital. It was a really busy time in her life; she was also Relief Society General President and was occupied with a ton of other activities. At one point, there was an unfortunate incident with one of the female doctors at the hospital and Eliza decided that the best thing to do would be to let the doctor go, to fire her. This doctor was so upset about this that she went straight to John Taylor, who was the president of the Church at the time, and she complained and John Taylor reinstated her. And I love Eliza’s response: Instead of trying to maintain her ground and be all upset and angry, as she could have done very easily, she said, “You know, I have too much going on in my life anyway. I’m just going to resign from the hospital board.” And she just took herself out of that situation. She didn’t want to ruffle any feathers with the priesthood leaders because she had this incredible understanding of the Priesthood and she supported it, and she knew that her efforts and activities were better served in other places. I’ve found myself keeping that in the back of my mind — whether it’s in interactions with professors or with people at church: What is really important and where is my energy best served? It helps me just to let go of some things. That’s just one little story. But I love the way Sarah Kimball was so innovative with her organization of the Relief Society as it was just getting started in Utah. You know, she was so careful as she planned out the different branches of the Relief Society and the women who were going to have different roles. She figured out the whole thing herself. I love that when Louisa Barnes Pratt’s husband was called to go on a mission, she was in Nauvoo, Illinois, at the time and she had to go across the plains by herself with her kids. She went to Brigham Young for help but he couldn’t help her cause there were just too many people in need. So she said, “Well, I’ll show him. I’ll do it myself.” And she did. She wasn’t bitter, she just figured out how to do it herself. These stories fuel me and I think, I can do anything. I can figure it out. I can decide where I want to spend my time and energy. They’re just little anecdotes, but they give me direction.